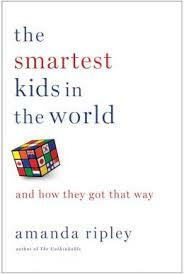 During the February Break I read the book, “The Smartest Kids in the World and How They Got That Way” by Amanda Ripley. Ripley is an investigative journalist who has written for The Atlantic and Time, among other magazines. The book follows three American high school students on foreign exchange programs in South Korea, Finland, and Poland. The author chose to compare the educational systems of the USA with those three countries because they scored better than the USA on the 2012 PISA. She was looking for why those three countries’ students, do better on the PISA than US teenagers. I didn’t agree with all of Ripley’s views, but the book was an interesting and valuable read and I recommend it to all parents, teachers, and administrators. She concludes that it is not one thing or one way that educational systems produce students that show improvement or score high on the PISA exam. Each country featured, did it slightly differently. I thought the best system was Finland. Their key is to only select the best students to go into teaching. It is difficult and prestigious to get into a College of Education in Finland. In comparison, there are too many teachers produced by universities in the US and most have very low admission standards. Many schools of education in the US accept students with below average SAT scores. She refers to leadership guru Jim Collins’s view in Good to Great, that having a great vision without great employees, makes the vision irrelevant. Finland has the smartest students going into teaching and hence, they have good schools. They also have a comprehensive exit exam for students, another characteristic Ripley shows improves PISA scores. The tests takes three weeks and students analyze difficult texts and produce long essays. South Korea has the “Iron Child” mentality to get their students to score high on the PISA. Korean parents are like Educational Coaches and drill their children at home in mathematics. They also send their children to “hagwon” schools, which are private tutoring companies that operate in the evenings, sometimes until the late evenings. Korean students go to school all day and night. The society also places a big deal on the comprehensive exam, with flights shutting down and traffic stopping on the morning of the test to ensure a quiet testing environment. Finally with Poland, recent educational reforms put rigor front and central in schools and more was demanded of the students. They also extended mandatory schooling for all students, mandating school for all 15 year olds before many of them go to vocational training. Ripley also described the freedom both Polish and Finnish teenagers have during the school day and in the evenings. They are expected to develop learning habits and autonomy at an earlier age than American teenagers. All three systems spend much less per student than the US schools. US schools Ripley believes spend money on technology, facilities, and sports (and other extra curricular classes) and teachers and parents do not insist on academic rigor and value the child’s self esteem over having them learn from failure and work harder. She also discusses the disparities in education in all three systems between the rich and poor. Ripley does not believe sports and the arts should be eliminated in US schools, but less emphasis should be placed on them. The book got me thinking about my current school, the International School of Belgrade. Our rigor is put in the curriculum through the International Baccalaurate, which Ripley mentions favorably in the book. The IB features exit exams with high standards and students are compared against other students from around the world as they complete high school. The IB is also adding eAssessments after grade 10, as a further check on the progress of our students. Her thoughts on mathematics and the critical role it plays in the lives of people also slightly changed my views. Research shows a direct correlation to math proficiency and future academic success and career earnings. Mathematics forces one to think logically and because so much of today’s jobs require data management, math is absolutely necessary for all students. Perhaps not at the highest levels, but all students should take the highest math classes they possibly can. She mentions that students work up to expectation and a school’s culture, should insist on academic rigor. For younger children, read to your children six nights per week. For older students, talk with them about their day and about the news of the world. Let their children make mistakes and then get right back to work. Teach them good habits and autonomy. Hold them to a high standard, supporting rigor in schools. Teach them the lessons of hard work, persistence, integrity, and consequences and those lessons will serve them well in the decades to come. One family took their children to a book store on a regular Friday night ritual. Get them in the habit of reading deeply every day, and parents should read books to serve as a model for them. Finally she mentions the role of the principal and/or director of the school. He/she is the key person in the school, and the act of selecting, training, and retaining the best teachers for a particular school is the most important function of the leader. It got me thinking of revising my methods of looking for teachers and I will look deeper into their university programs. She also suggested to watch them teach a lesson before hiring to get a better sense if they can do the job. Although she is critical of US schools in general, she does cite many instances where US schools are doing well. The book is not 100% US-bashing. I highly recommend this thought provoking book for anyone interested in education. Here is a link to a book reading by Amanda Ripley at the Politics and Prose Bookstore in Washington DC in August of 2013. Previous Post What is so Important about the PISA Results?